I've known Kat Coyle for a couple of years now from working at The Little Knittery. Mostly in passing as we never worked together, but once she bought the store in October we've become a lot closer. I admire Kat for her artistry & mastery of Lace, her gorgeous embroidery and most of all her endurance as an amazing single mom & shop owner. So when I received a package of gorgeous yarns from Knit Collage my admiration turned to inspiration and I knew I wanted to make something that Kat would want to wear. So here it is, the Coyle... for S, M (L) made using #19's, 1 skein of Knit Collage's "Sister" yarn in Camel for the main body and 1(2) skeins of their "Rolling Stone" yarn in Poppy for the trim. 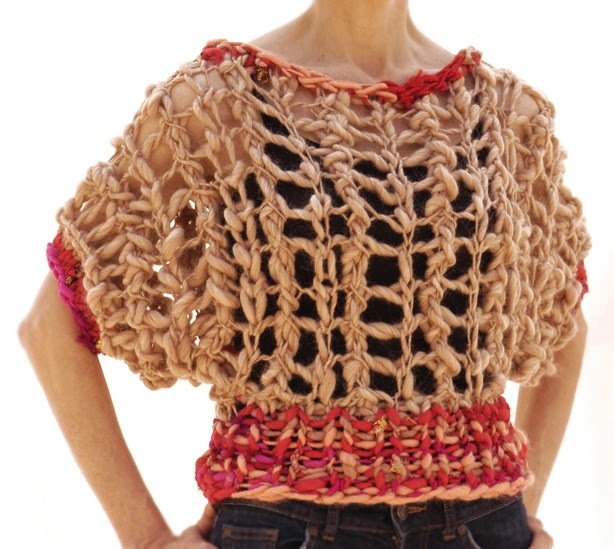 This is a pretty simple construction for an intermediate knitter. There is some involvement on the knitters part to get the perfect fit as the pattern is based on the size shown with adjustments for larger or smaller sizes noted along the way. Love it! That's so adorable. Love the lacy but textured feel of it. Another beautiful piece, Karen! Karen! I love it and am so flattered. I look forward to making one for myself!!! Any chance the first design is available for purchase or otherwise? I LOVE IT AND CAN'T WAIT TO KNIT IT! Also, where do I find the yarn... I live in Virginia. Thanks Joy! I'll email you with the information.